Actually, Carson and Redmond seem to have been concerned less with defending Ireland than in holding a Dutch auction of lives to prove to London that that metropolis could trust either of them to run Ireland in its interests more loyally than his opponent. The victor would be the one who could claim to have sent out the most young Irishmen to their deaths. 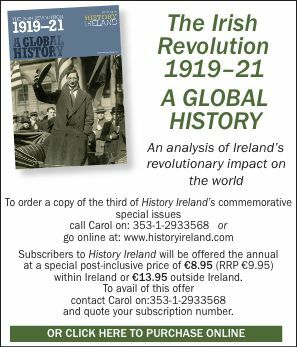 In the end, each inspired more such deaths than all Irish republican leaders since 1798. In any case, in the overall history of the causes of the First World War, Germany appears less an aggressor than an initiator of a pre-emptive strike against its encirclers. France and Russia were at least as predatory. France coveted (reasonably) Alsace-Lorraine and (less reasonably) the west bank of the Rhine. Russia sought to hegemonise the Balkans and grab north Anatolia and Constantinople. Though Britain was too busy trying to manage its own huge empire to equal such visions, it added fuel to the fire by joining the Franco-Russian Entente and rejecting a number of possibilities for better relations with Germany.